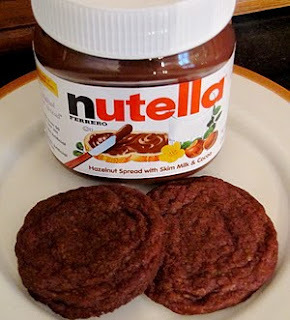 herding cats & burning soup: Tasty Tuesday: Nutella Cookies! This weeks Tasty Tuesday happens to be a Passionately Pinterest Pin too! Score! DO NOT ADD SUGAR! These are the best cookies EVER! 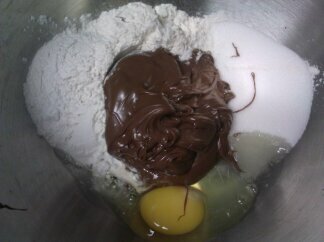 1 cup Nutella, 1 whole egg, 1 cup flour - bake for 6-8 min @ 350 degrees. OMG!!!!!! I decided to go with the original recipe that includes Sugar and I'm so glad I did. These wouldn't be nearly sweet enough without it and weren't really too sweet with the added 1/2 cup of sugar the recipe called for. Any hazelnut chocolate spread will do. This is the one our store carries. 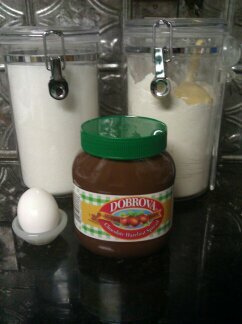 So simple with only 4 ingredients. An electric mixer will work best here. The batter is pretty dry so if you attempt using a hand whisk you'll get one nice old big clump right in the center of the whisk. Roll dough into 1 inch balls then flatten with the bottom of a glass or bowl. These do spread out quite a bit so be sure to space them out or you'll have some funky square cookies. 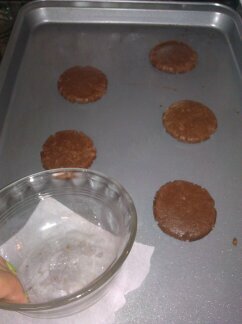 Instead of flouring the bottom of the glass I used a piece of parchment paper which worked great. Tada! And to add a bit of Christmas some red and green sprinkles! The recipe didn't call for the extra nutella smear but I thought they needed the extra flavor. They really don't taste like Nutella at all even though there's a cup of it in the recipe. Taking them out at the lower baking time will make for chewier cookies. They won't look done but they'll end up nicely. They're almost like brownies. Well, the edge where it's a little crunchier. I happen to LOVE that part of brownies so enjoyed these. Let them sit 5 minutes before removing from the pan. Otherwise they'll be way too gooey and will fall apart on you. So the claim of BEST COOKIES EVER? They are pretty tasty but I wouldn't go quite that far. If they really tasted like Nutella? Then we'd be talking. 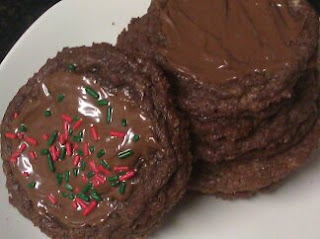 But for a quick chocolate cookie with minimal ingredients? Not too bad. They'd be great for ice cream sandwiches or with a smear of peanut butter. Mmmm.